Charles Wilkerson,[left], Matthew Hayes, [center], and Kenneth Williams. 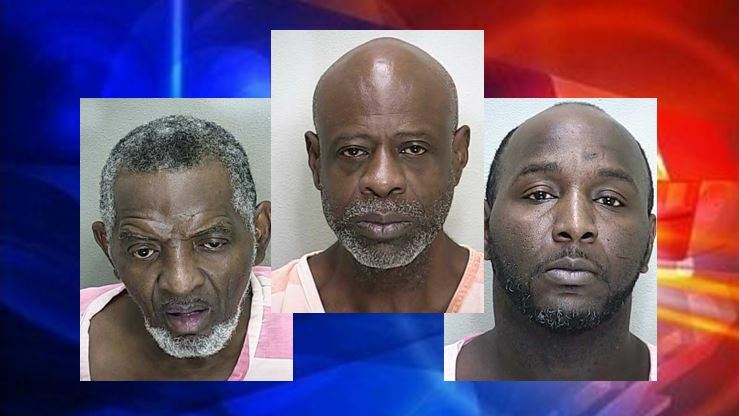 Ocala, Florida — Three career criminals were arrested after they kidnapped an Ocala man. The Ocala Police Department responded to 2147 Northwest 1st Avenue, after a man who had been kidnapped was able to “sneak” a phone call and dial 911. Police say the suspects, Charles Wilkerson, 64, Matthew Hayes, 60, and Kenneth Williams, 43, kidnapped a man that they believed had a large sum of money on his person. The victim was then forced inside the aforementioned residence. Once inside, the suspects began demanding money from the victim. According to reports, when the victim denied having any money, Williams punched the victim on the mouth and split his lip. The victim was then forced into the back bedroom of the residence, at which time Wilkerson and Williams pulled out handguns and pointed them at the victim. Wilkerson fired a shot and hit the wall. He then stated that if the victim did not give him money that he would shoot the victim. Again, the victim stated that he did not have any money. Police say that the victim was then forced to remove all of his clothes so he could be searched. When the suspects did not locate any money, they instructed the victim to sit at the kitchen table. The suspects told the victim they he would not be permitted to leave until he was able to “come up” with some money. Investigators said that the victim was forced to sit at the table for hours while being tormented. At some point during the incident the suspects left the room and the victim was able to call 911. The suspects denied any wrongdoing and refused to cooperate with police. Wilkerson was arrested and charged with Kidnapping, Robbery with a Firearm, Aggravated Assault with a Firearm, and Possession on a Weapon by a Convicted Felon. Including his most recent arrest, Wilkerson has been arrested 14 times on more than 40 charges. He was released from jail on a $92,000 bond. Hayes was charged with Kidnapping and Possession of a Firearm by a Convicted Felon. He has been arrested 13 times and has more than 80 charges. Hayes is currently being held on a $40,000 bond. Williams was arrested and charged with Kidnapping, Robbery with a Firearm, Aggravated Assault with a Firearm, Possession of a Firearm by a Convicted Felon, Battery, and Driving on a Suspended License (Williams drove a car to the residence). He has been arrested 22 times and has more than 100 charges. Williams is currently being held on a $94,500 bond.